During Operation Desert Storm, a creative war plan was put into action that aimed at making Saddam’s forces think that a massive beach landing on the Kuwaiti coastline was imminent. A pivotal component of this ruse was extremely heavy shelling that only the USS Missouri and USS Wisconsin’s 16 inch guns could provide. Before we get to these ships’ participation in the feint that would lead to a historically rapid 100 hour ground war, it must be made clear that this was not their only contribution to the war. Far from it actually. Both ships would provide key combat capabilities during Desert Storm. These included precision strikes on Iraqi bunkers and installations miles inland with their 16 inch guns, assisting in clearing minefields, using their Pioneer drones to reconnoiter Kuwait for Iraqi targets and troop movements, just to name a few. Additionally, the Wisconsin would also serve as the anti-surface warfare command ship for the Northern Persian Gulf Surface Action Group. On February 3rd, the Wisconsin fulfilled her first call for naval gunfire support since 1952 when she rippled off eleven 16 inch shells over 20 miles at an Iraqi artillery position in southern Kuwait. The fire support was coordinated by a Marine OV-10 Bronco. Like the big Battleships, the Broncos would prove their worth despite their age and supposed obsolescence during the conflict. Weeks later, on February 23rd, after over a month of continuous air strikes on Saddam’s forces in Iraq and Kuwait, the much anticipated ground offensive was about to begin. The plan was to play into the Iraqi’s expectation that allied forces would invade Kuwait directly via a marine landing on Kuwait’s Faylaka Island. In doing so they would draw Iraqi forces further toward the Persian Gulf, turning their focus away from the south and west where throngs of coalition armor were ready to pounce. If it worked as planned, in one wide left hook, Saddam would be outflanked and heavily outgunned. The only issue is that they really needed to Iraqis to believe, for certain, that the onslaught would be coming from the east instead of the southwest. As such, coalitions planners needed to put on a real spectacle that would make Iraqi commanders believe a beach invasion was imminent, and just some air strikes wouldn’t do. With this in mind they called up their biggest guns available to continuously bombard the supposed beach head to be, the two Iowa Class battleships in-theater, the Wisconsin and Missouri. As the shelling began, the ship’s Pioneer unmanned aircraft that spotted targets for the Missouri’s 16 inch guns buzzed overhead in the dark between shells detonating all over the coastline. The initial diversionary bombardment of the shore was both terrifying and demoralizing for the dug-in Iraqi troops. After Missouri’s initial sustained shelling of the island, Wisconsin sent its Pioneer buzzing over Iraqi heads in preparation for another barrage, during which Iraqi soldiers could be seen looking up blindly into the air waving makeshift white flags signaling their surrender. The next day, the USS Missouri was escorted by the frigate USS Jarrett and the Royal Navy destroyer HMS Gloucester within ten miles of the Kuwaiti coast to provide gunfire support for advancing coalition troops. Another Marine assault feint occurred on the 25th, when 10 USMC helicopters executed a nighttime assault ruse near the port of Ash Shuaybah, supported by the guns of the “Mighty Mo.” The event spurred the Iraqis into firing a Silkworm anti-ship missile at the massive Battleship. The first of two missiles fired lost its tracking on the ship due to chaff fired off by the small flotilla, and landed between the Missouri and the Jarrett. The second was detected almost two dozen miles out as it launched from the shoreline. It was tracking flying directly toward the Missouri. The HMS Gloucester identified the missile as hostile and rippled off two Sea Dart surface-to-air missiles, blasting it out of the sky. An E-2C Hawkeye was monitoring the attack and quickly leveraged other surveillance assets in an attempt to target the Silkworm missile launch site. Once located, the Hawkeye directed A-6E Intruders to take it out under a high-priority strike order. They successfully did just that under heavy anti-aircraft artillery and missile fire. No less than a dozen Mk20 Rockeye cluster munitions were lobbed onto the missile’s launch site. It was totally destroyed. This event was not only the single anti-air naval missile engagement of the war, but it was also a sign of things to come as far as time sensitive targeting and tightly knit joint operations. During the exchange there was a somewhat mysterious but not deadly friendly fire event. Supposedly the USS Jarret’s Close In Weapon System cued on the chaff cloud that was expelled by the Missouri as a countermeasure during the Iraqi missile attack, and 20mm rounds ended up striking the Battleship even though it was over two miles away. Nobody died in the incident but there was one injury and questions as to how the system cued on the chaff when it is designed not to do so. In the end, the marine landing never happened and the feint allowed the coalition ground forces to surprise Saddam’s military by swooping into Iraq just west of the Kuwaiti border. Meanwhile, other allied mechanized units would blitzkrieg through the desolate deserts of southern Iraq, destroying anything that opposed them. Within 100 hours the ground war would be over and Iraq would have capitulated defeat. During the Wisconsin’s eight months in the Persian Gulf, she had flown 348 UAV hours, had 661 safe helicopter landings, steamed 46,000 nautical miles, fired 319 16 inch gun rounds, 881 5-inch rounds, 5,200 20 mm Phalanx CIWS rounds.,and launched 24 Tomahawk cruise missiles. 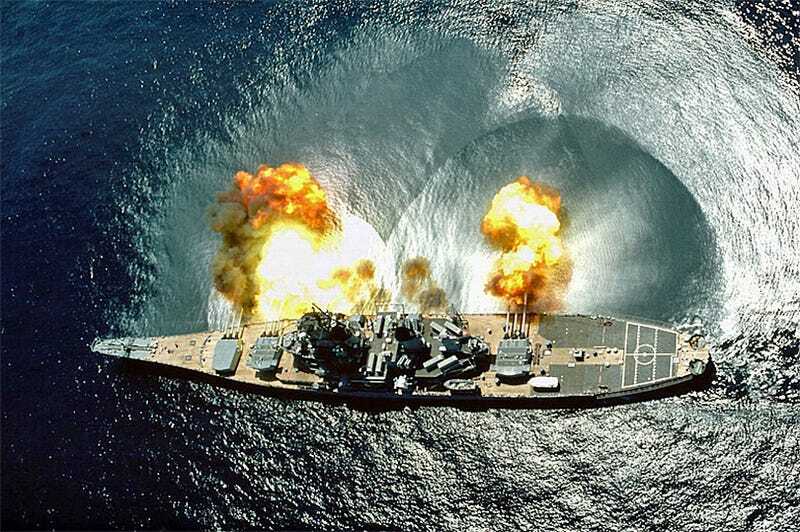 The Missouri had destroyed 15 naval mines, fired a total of 759 16 inch shells and launched 28 Tomahawk cruise missiles. Even though the Battleships had proven to be irreplaceable weapons considering the strategy that was put into play during Desert Storm, the conflict would be their last. They would all be decommissioned soon after, and the debate over the need for robust naval gunfire support would rage on to today.